Spent the majority of of his life in Spain. Learned at the great artistic center at Venice . He had a very large library and many Friends. 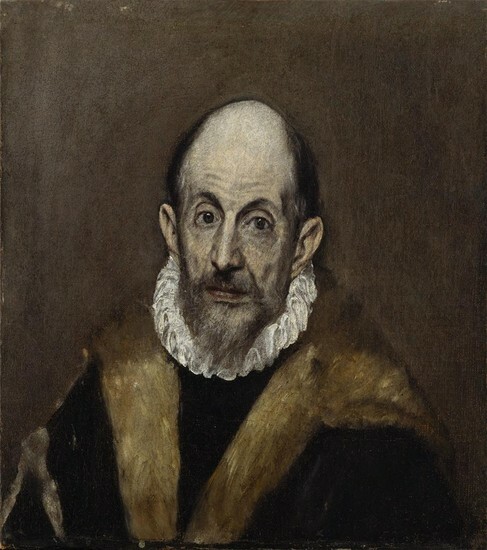 El Greco did a lot of classicism because he brought back many styles of art that were used in Ancient Greece and secularism because he did many portraits which focused on an individual scene form the bible. As well as naturalism because he painted people as they were and not how they were supposed to look like. This painting was made somewhere in between 1590-1600, but can now be viewed in The Metropolitan in New York. This piece was new because it showed people that not all god paintings showed people who were perfect El Greco painted people who were natural and real. This piece was showing an older man who was completely natural and real. This showed people that they should focus on what people where really like and not what they should look like if they were perfect and godly. This painting is very interesting to me because it is so simple but still beautiful. "El Greco (Domenikos Theotokopoulos) | Portrait of an Old Man." El Greco (Domenikos Theotokopoulos). N.p., n.d. Web. 04 Dec. 2015.